One has only to glance at a physical world map depicting the ridges and canyons on the ocean floor to realize that a lot has taken place there. I hope my analysis of the history of the Caribbean and Mediterranean Seas will be helpful to geologists when it comes to interpreting other parts of the world. There are other places that I have found to be of particular interest. 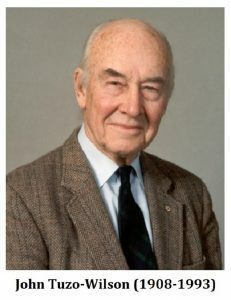 John Tuzo-Wilson (1908-1993) was an acclaimed Canadian geophysicist and geologist who made important contributions to the theory of plate tectonics. In 1963 he proposed that the Hawaiian-Emperor seamount chain resulted from the Pacific tectonic plate drifting over a ‘hotspot’ of volcanic activity. This left a trail of increasingly eroded volcanic islands and seamounts in its wake. He attributed a major kink in the chain to a change of direction in the movement of the plate, and this is the explanation that was generally accepted, until recently. It has long been accepted, as Tuzo-Wilson proposed, that the Hawaiian Islands continue to be generated as oceanic crust moves over a hot spot, or plume, rising from deep within the Earth’s crust. Islands that sank beneath sea level as they were carried away from the hotspot continue as subsea-mountains in a fairly straight line to the northwest. The chain of islands then turns sharply to the north, with their ages continuing to increase. The last mountain at the Aleutian trench has an age of around 70 million years. The sharp bend in the line, which happened about 43 million years ago, records the approximate age of the impact responsible. A direction of seafloor movement that had been fairly consistent for at least 27 million years, abruptly changed. Within hours, perhaps, mantle currents beneath the Pacific Basin changed from moving north to moving west. A great circle extension of the present Hawaiian Island chain leads west directly to China, and it is inferred that the cause of the change of direction of the entire Pacific basin, from north to west could be the impact site now occupied by China. 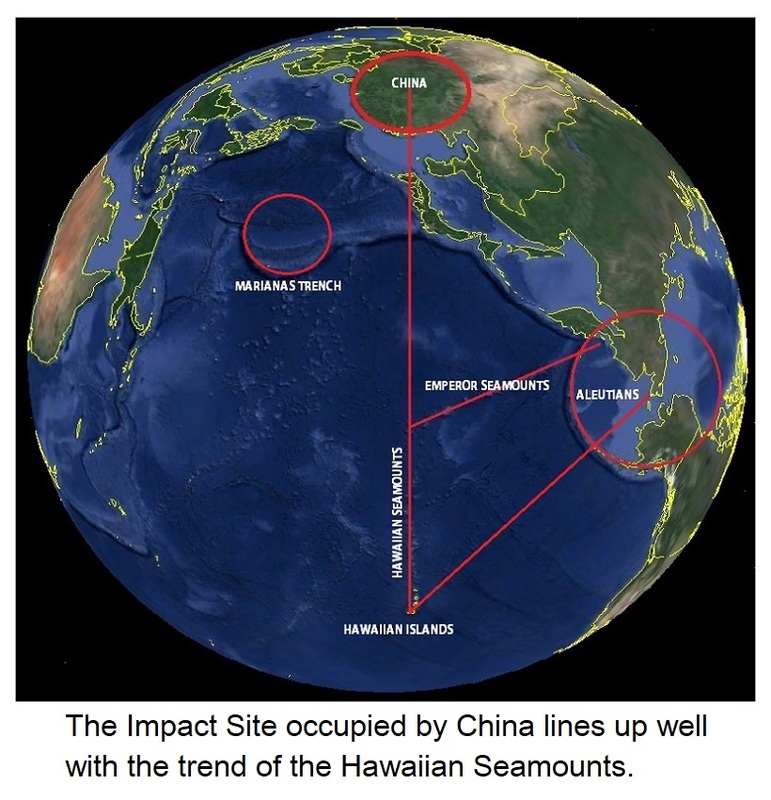 Minor dislocations in the Hawaiian subsea mountain chain reflect more recent, smaller impacts. The direction of the mountain chain isn’t the only thing that changed. The ages provided, and the distances involved, indicate a significant increase in speed following the introduction of additional energy. 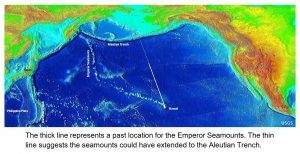 Measured in seamounts per 1,000 kilometers, the volcanic activity rate increased from 13 for the Emperor Chain to 18 along the Hawaiian Chain, which suggests an increase in energy of close to 40%. It has been reported that a world-leading super-computer has been added to the investigation, so you already know it will provide great results. Recent research, it is claimed, has revealed that it was really the hotspot itself that moved. ‘Wikipedia’ informs that if the hotspot had remained above a fixed mantle over the past 80 million years, the latitude of multiple samples of widely differing ages should have remained constant. The latitudes were calculated from numerous paleomagnetic measurements of rocks having determined ages over a range of 80 million years. Keep in mind as you read this, that there have been two axis changes within only the past 74,000 years and the scientists haven’t recognized them yet. The super-computer results, it turns out, support the thesis that it was “unexplained changes” in deep mantle currents that were responsible for the 600 change of direction between the Hawaiian and Emperor Seamount ranges. In the 1950’s geologists from Cambridge University in Great Britain, including Dr. Keith Runcorn and his students, began studying paleomagnetic data and found that rocks of different ages, from neighboring localities, indicated changed magnetic pole positions. A rock type commonly sampled was basalt, which is extruded as lava at a high temperature, and cools rapidly when it comes into contact with air or water. Basalt contains a relatively high amount of the magnetic mineral, magnetite (Fe3O4). Magnetite crystals which develop as the flow solidifies orient themselves parallel to force lines of Earth’s magnetic field. This enabled researchers to calculate the position of the closest magnetic pole at the time the lava crystallized. 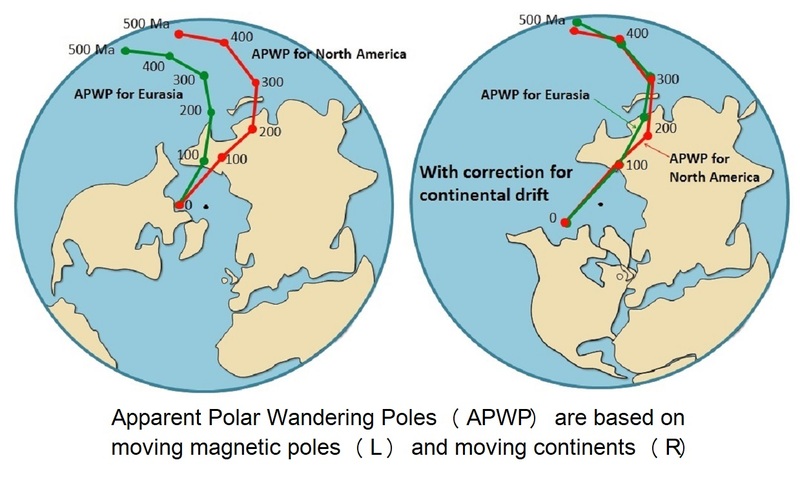 They were then able to plot what they termed “polar wandering paths” that showed how the closest magnetic pole had moved over the time interval determined. Later, when it was realized that continents can move, scientists felt it necessary to correct the earlier work on the grounds that it was the continents that had moved, rather than the magnetic poles. Now, sadly, those determinations will have to be changed again, since the movements were the result of axis changes. Continents move slowly while axis changes occur rapidly so that in practically every case the change can be confidently attributed to axis change. At an axis change the magnetic poles are moved rapidly, often to lower latitudes, and then take the following several thousands of years catching up with the newly situated geographic poles. Points at the geographic poles always move to lower latitudes, meaning closer to the equator. Earth is oblate in form and it takes a while for its preferred shape to re-establish. 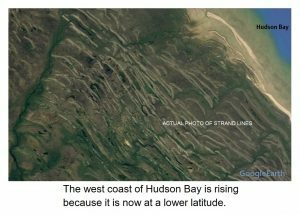 Multiple strand lines along the west coast of Hudson Bay have resulted from Earth seeking to acquire its preferred shape since the last significant axis change, 10,500 years ago. The land here is rising rapidly, but little of this change is due to the removal of an ice cap. Land further away from the former pole is not rising noticeably even though it was covered by a similar thickness of ice. Therefore, at least most of the uplift can be confidently attributed to axis change. 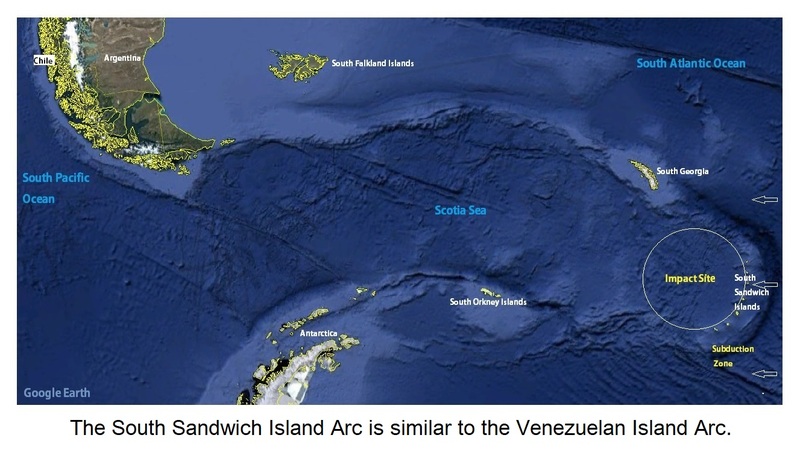 Most island arcs are situated in the Pacific, although the Atlantic Ocean has two. 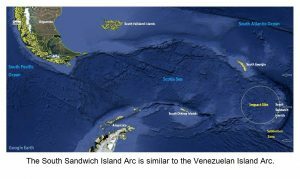 The Leeward and Windward Islands form a volcanic chain above a subduction zone at the Venezuela Basin, while the South Sandwich Islands are situated 1,500 miles (2,400 km) east of the southern tip of South America. Both sites are the result of large asteroid impacts. Just as the Puerto Rico trench at the Venezuelan impact site subducts oceanic crust that was formed at the mid-Atlantic ridge, seafloor from the mid-Atlantic ridge is also being subducted at the South Sandwich Trench. To the north and south of this site, seafloor from the mid-Atlantic ridge sweeps past, being dragged against two parallel fault systems, so that Tierra del Fuego and the Antarctic Peninsula have been retarded in their westward movement and both curve back to the east. The Scotia Sea occupies the space between these two faults, and its seafloor is practically stationary. The study of Plate Tectonics has been developed about as far as it can go without a greater understanding of the energy that drives it. Island arcs continue to present a mystery to most of science even though their origin was explained by Allan O. Kelly and Frank Dachille, Ph.D., in their book ‘Target: Earth’, published in 1953. Papers on it were presented at the Western Amateur Astronomer’s Convention, in 1955, and the geological section of the American Association for the Advancement of Science, in 1957. ‘Target: Earth’ was written before much of the information available today was known, and some of its claims have been disproven. It remains, however, an example of what science could accomplish if those with open minds were to receive more encouragement to challenge dogma. During that infamous episode in American history known as ‘The Velikovsky Affair’, one haughty professor commented smugly that he had a special bookshelf for books like ‘Worlds in Collision’, and never once had he been tempted to take down any book he had placed there. I wonder if ‘Target: Earth’ was there as well. An island arc results from the impact of an asteroid with enough force to generate a convection cell, onto oceanic crust that is moving away from a mid-ocean ridge. Some scientists have claimed that Earth’s internal energy level, as reflected in its subsurface temperatures, is partly left over from the time of its formation and is partly the result of radioactive decay, but these must have just struck someone as a good idea at the time because neither explanation is reasonable. If any of Earth’s thermal energy reserve had been retained from the time of its formation, plus whatever is due to radioactive decay, it could not have decreased to accommodate the growth of Pangaea and then increased again. 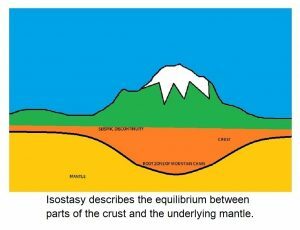 It is an interesting fact that much of Earth’s continental crust has been contiguous in the past and now is widely dispersed, reflecting variations in Earth’s thermal energy reserve. When the crust is widely dispersed it means that the internal energy reserve is high. When impacts are infrequent convection and mantle current activity is reduced. Oceanic crust thickens as it cools, leaving currents in the mantle to push against the roots of mountains. Larger land masses are moved, collecting islands as they travel. Mountains have roots that extend deeper into the mantle than do lowlands, a condition geologists term ‘isostasy’. Eventually, should the energy level run down, most of Earth’s continental crust will end up contiguous and mid-ocean rift activity will cease. There is no indication, however, that this will happen anytime soon. Earth’s internal energy level is presently high and has long been on an upward trend. The last supercontinent began to disintegrate at the end of the Permian Period, 252 million years ago, and Earth’s thermal energy reserve has increased greatly since then. Lands once contiguous are now separated, and islands – the proof of a high internal energy level – litter the seas. A question of natural interest to humans is whether the rate of major impacts will stay at its present high level, or even increase, and if so within what time frame. Most island arcs in the Pacific Ocean occur in the far-western part, which begs the question “why?” At the end of the Permian Period (beginning of the Mesozoic era, 252 million years ago) another major event occurred. A connected system of extremely deep faults, (mid-ocean ridges) along which new oceanic crust is created, formed over the entire planet. Upwelling currents move away from these spreading centers, producing parallel, transverse faults (at a right angle to the spreading center) of great depth. These provide a conduit for the rock peridotite, the progenitor of basalt, to force its way up toward the surface of the seafloor. The faults extend beyond the depth of convection cells, and island arcs are distorted as they are pushed aside until the entire seabed has been reworked. A clutter of distorted ridges and deeps on the floor of the western Pacific Ocean is an expression of this process. Eventually, most of those island arcs will disappear, by subduction (being returned to the mantle) or by obduction (being added to a continent). The floor of the western Pacific Ocean will then have the uniform appearance that characterizes it further east. That is until more impacts occur. The enormous African impact may have been responsible for the Permian Period coming to a close when it has been recognized that well over 90% of all advanced species on Earth became extinct. Advanced life on Earth came close to ending then. Obvious evidence of major impacts from earlier in the Paleozoic Era was also removed at that time. For those who are attracted to the science of geology, a promising time has arrived. The oppressive yoke of uniformism that has corrupted the science since the early 1800’s is being overthrown. 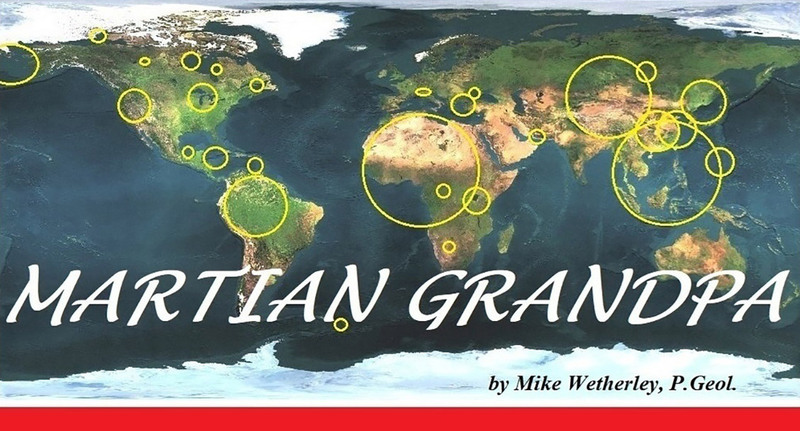 You will be able to assert “There was a worldwide flood.” without being accused of being a Creationist. You will be able to acknowledge that every planet and moon and asteroid, including Earth, began, and persists, as a result of catastrophism. Worlds change their orbits from time to time and sometimes interact. When Earth becomes directly or indirectly involved, its inhabitants can become greatly distressed, and a new age begins. Know that oceanic floods ravage the continents with such force that continental ice caps terminating within a continent are no match for them, and when the flood is reduced to a gentle swell it can lay out pine needles and rootlets in a hundred delicately stacked beds. It can provide a jigging action to stream gravels to produce the paystreak on Eldorado Creek in the Yukon, one of the greatest pay-streaks of gold ever found. But when it is at its most fearsome it can entomb entire tribes of woolly mammoths, or pile up African hippopotami in Europe in such numbers that their bones have been mined for bone ash on an industrial basis. The new theory of Plate Tectonics was developed by eager and competent investigators coming from diverse geological backgrounds. It all came together splendidly at first and everything seemed to make sense. The theory, however, was developed without regard for the origin of subduction zones, or the source of their energy. Eventually, the absence of answers to these questions became too unsettling to be ignored. Eventually, the dogma of a new orthodoxy began to develop, and the most promising new specialty in the science of geology began to drift away from reality in a parody of the plate motions it now struggled to explain. One problem was the Philippine Plate. When the Marianas asteroid impacted in the western Pacific it affected a significant part of the Pacific basin. The greatest depth below sea level anywhere on Earth lies within an arcuate deep known as the Marianas Trench. Several volcanos of the associated island arc have erupted in recent times. This oceanic deep marks a subduction zone whose linear extensions reach toward Japan and New Guinea. Under different circumstances, a pair of essentially parallel faults would have formed, just as they did in the Caribbean, the Mediterranean, and the Congo. Faults, however, tend to follow paths of least resistance. In this case, a north fault formed toward Japan and the less well-defined south fault formed toward New Guinea. These faults are oriented across the direction of movement of oceanic crust that they are now required to subduct. 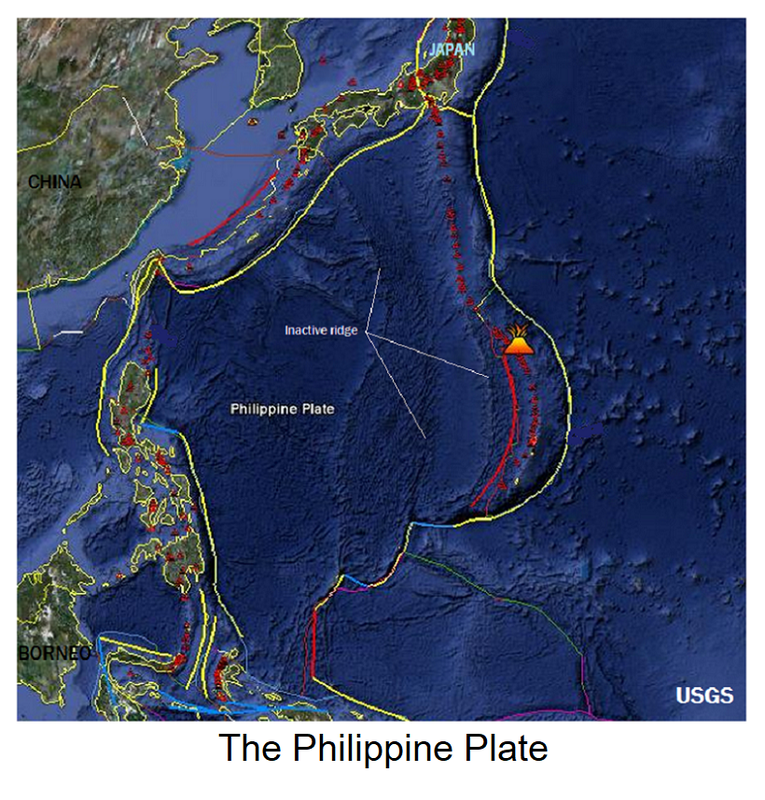 The Philippine Plate is the most completely delimited by subduction zones of any tectonic plate on Earth. At the Puerto Rico subduction zone in the Caribbean, the island arc has begun to split in two at its northern end, due to the westward movement of the North American plate. The island of Guadeloupe, which is situated near the southern limit of the split, has almost become two islands. Similarly, subduction of the Philippine plate at its western boundary has resulted in persistent volcanic activity along its eastern boundary. As the Philippine plate is being subducted at its western boundary, volcanic activity at the East Pacific Rise enables this process to continue. 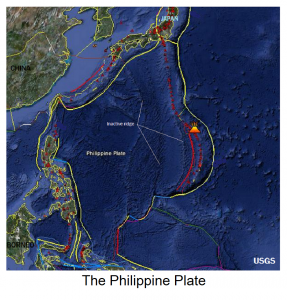 A spreading center on the Philippine plate traveled west beyond the influence of the plate’s eastern boundary subduction zone. As it traveled, volcanic activity along it diminished, and it cooled and subsided, eventually becoming an inactive submarine ridge. As this first volcanic zone cooled, another developed above the eastern boundary subduction zone, and the process repeated. The first inactive submarine ridge in this process, having a north to south length of some 3,000 km (1,900 mi) has moved westward some 1400 km (870 mi) from the eastern boundary subduction zone. Three successive ridges have formed in this manner, while volcanic activity continued along the east limb of the convection cell resulting from the original impact. In the accompanying USGS interpretive map, the present zone of volcanic activity is marked by the volcano symbol. In this case, connecting faults failed to form a parallel pair, but instead defined a small plate that was itself being subducted to the west. This put tension on the volcanic zone, causing it to move west. Since new crust continued to arrive, a new volcanic arc developed above the eastern subduction zone. This process will continue for as long as new crust is produced at the East Pacific Rise. 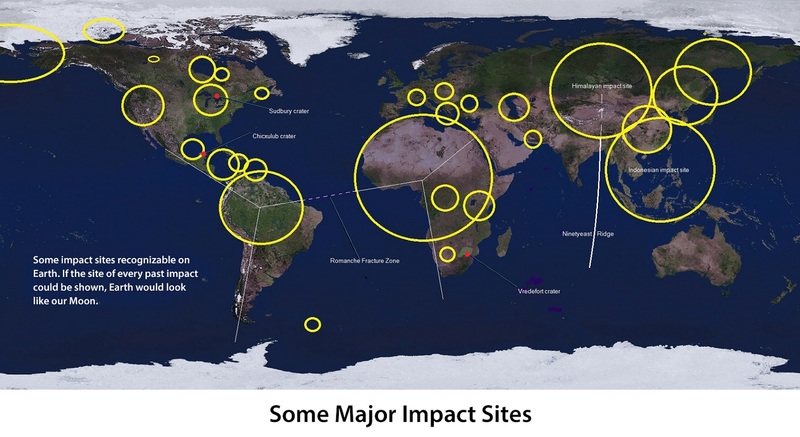 There are impact sites all over our planet, hiding in plain sight. Countless others remain hidden from view, ready to contribute a reactivated limb for a subduction zone when called upon to do so. 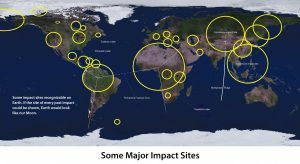 These impact sites will remain in place until they are erased by the inexorable spreading of a mid-ocean ridge. This is the only process, apart from additional impact, that is capable of expunging evidence of an impact site from the crust. The Vredefort crater in South Africa is less than 200 mi (320 km) across and is described in Wikipedia as “one of the largest ever to strike Earth” (in the past 600 million years). In my illustration identifying some of the larger sites, the Vredefort crater is barely noticeable. At this scale, Vredefort, Chicxulub, and Sudbury Basin rated one, two and three in size by Wikipedia, are all too small to even show up well. Earth’s entire surface has been reworked by asteroid impacts. Much of the evidence has been removed by the process of ocean-floor renewal which spreads from mid-ocean ridges, but on land, some evidence has been preserved. If every impact site on Earth’s surface were visible, the result would appear just like the surface of our Moon.